… all for naught. The loot gods sit on their lofty perches laughing at my feeble attempts to get that elusive Jibbers blade. Clearly I need to try something new. And so I thought, hmmm, what says “I care” more than a song written JUST FOR YOU, chest? OK, so I borrowed the melody from “Hit the Road, Jack” by Ray Charles (László Csotye’s karaoke version used in the video can be found here) and put together this little duet between Even-the-pally and Jack Jibbers. Lyrics are in the captions – if you don’t see them, click the little “CC” button at the bottom. They’re a bit confusing – the captioning I used let me use formatting, so it was easy to distinguish which lines were Even’s and which were Jack’s. Unfortunately YouTube stripped the formatting when I uploaded the captions file, so it’s all ordinary plain Arial 28-pt text. Meh. At least now I do have definitive seen-with-my-own-eyes proof that Jack Jibbers’ cursed blade does indeed exist. I was starting to wonder! But the other night, I was about to make my nightly Two-Toed Tobias run and asked Keava if he’d like to come along. Turns out Keava doesn’t even own Three-Barrel Cove and had never run ANY quest out there. No problem, that’s what guest passes are for. Right before we opened the chest, I told him he didn’t have to pass me the Jibbers if he pulled it… you see where this is going, right? Naturally the first thing we did was run around the wildy until we found some likely-looking mobs so we could get Keava killed and see the blade in action. I’d been under the impression that using the blade invoked an animation in which you dramatically stabbed yourself in the chest with it and miraculously rose from the dead. It’s not QUITE that cool. There’s a bit of black smoke, and then you’re just… alive. Well, kinda. You’re undead, and you have a scimitar sticking out of your chest. I would’ve preferred the self-stabbing animation, but it’s still pretty cool. … and I still don’t have one. Im getting close with TP from favor runs. Then ill be able to run more frequently and help get that blade for you. now I want taht blade too! If you tickle a chest behind its ears, watch out… it’s really a mimic! 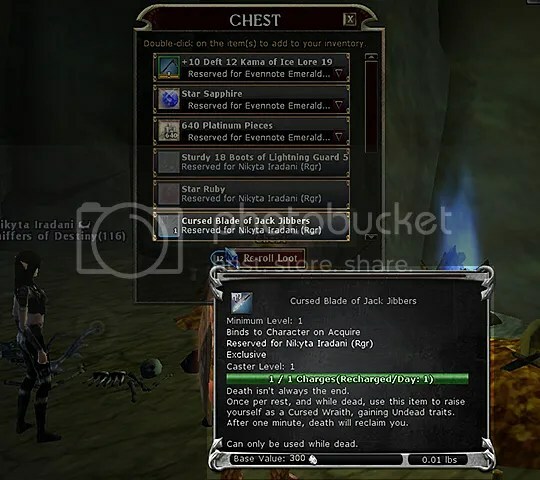 Pingback: DDOCast 436 – Spell Selection: Clerics, Favored Souls, & Paladins « DDOcast – A DDO Podcast!